Due to their complexity, sensitivity and high degree of integration, mountain areas and their forelands cannot be accurately described and analysed in integrated models with present capabilities. Yet, this is needed to determine the degree of sustainability of various management alternatives and to derive appropriate recommendations for public and commercial stakeholders and administration. 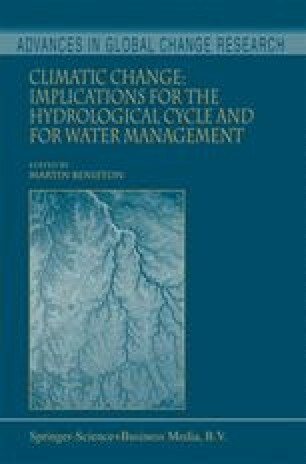 Within the framework of the GLOWA (Global change of the water cycle)-Danube project, which is funded by the German Ministry for Research and Education (BMBF), a tool to determine water fluxes, their coupled fluxes of matter and matter turnovers is being created by a interdisciplinary group of researchers, combining expertise in the fields of hydrology, water resource engineering, meteorology, glaciology, geography, ecology, environmental economy, environmental psychology and informatics. It aims to develop and validate integration techniques, integrated models and integrated monitoring procedures and to implement them in the network-based Decision Support System DANUBIA. It will contain the essential physical and socio-economic processes required for realistic modelling of water and matter fluxes in mountain foreland situations. The large gradients in climate, vegetation and water supply, along with the good data coverage in both natural and social sciences, make the Upper Danube Catchment ≈ 78.000 km2) an excellent prototype for an integrative research approach. On completion, DANUBIA will be able to simulate water related scenarios in environmental management and will examine the sustainability of the proposed solution scenarios in large, heterogeneous catchments. In order to develop DANUBIA as a mutual transdisciplinary communication platform of the participating disciplines, new information technologies will be utilised. Based on the industrial standard UML (Unified Modelling Language) as the common meta- modelling language, DANUBIA will be capable to integrate platform independent modules of all participating partners (e.g. climate model, SVAT model, ground water model, micro economic model, agent model describing behaviour. DANUBIA will be spatially distributed and raster-based at its core, which simplifies the interdisciplinary description of the interactions between the considered processes. It will apply the concept of “proxels” (Process Pixel) as its basic building blocks, which has different dimensions depending on the viewing scale and connects to its environment through fluxes, such as runoff formation, lateral flow, evapo-transpiration, plant growth, economics or agents. A detailed description of the DANUBIA concept within GLOWA-Danube, its goals, scientific and technical structure, implementation and expected performance is presented.